"The Unvanquished: They Survived the Nazis, Studied in Germany—and Liberated Themselves" written by Michael D. Lemonick. Published by People Magazine on November 6, 1995. Drs. Paul and Anna Ornstein are part of the group who were interviewed for the article. 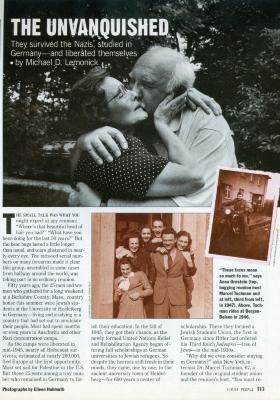 Entire article can be found in Dr. Anna Ornstein's file in the Center for Holocaust and Humanity archives.